- Bible of Elizabeth A Brantley Thames lists Steve Thames b 17 Feb 1875 d 4 Nov 1948. - Buried next to Bama H 1 Dec 1879-15 Jun 1961. Nathaniel Thames, Son, 1, AL, AL, AL. E-mail written Feb 2004 from Ben A. Thames, Pascagoula, MS, e-mail address. Stephen E. Thames, Boarder, M, Feb 1875, 25, Sng, AL/AL/AL, Supt. Farm. From a tribute from a comrad in a 15 May 1912, Conecuh County newspaper, provided by Hub Broughton in e-mail of 2 Aug 2002. Lucy Jane Thames, is my paternal grandmother. I have digital photos of Thames markers at Brooklyn Baptist Church, Brooklyn, AL and will be glad to share with anyone that would like them. I also have wedding announcement and wedding photo of Lucy Jane Thames and Charles A. McLendon and photos of all their children. 1. 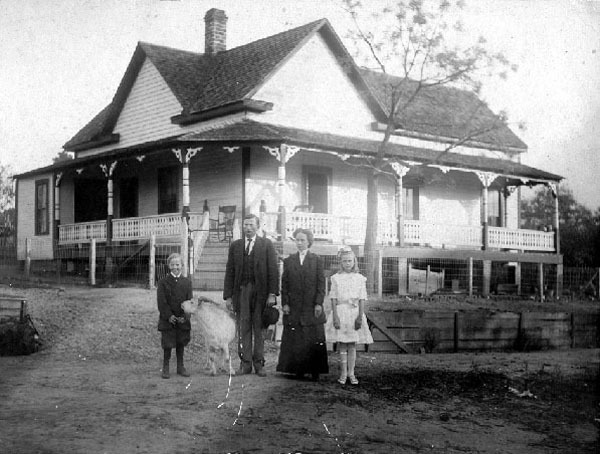 LUCY JANE THAMES was born March 22, 1878 in Florida, and died March 09, 1922 in Brooklyn, Conecuh Co, AL.. She married CHARLES A MCLENDON April 16, 1902 in Brooklyn, Conecuh, AL., son of ANDREW MCLENDON and CAROLINE CONNER. He was born February 19, 1851 in AL. or GA., and died April 27, 1919 in Brooklyn, Conecuh, AL..
2. i. FORREST CORNELIUS MCLENDON, b. 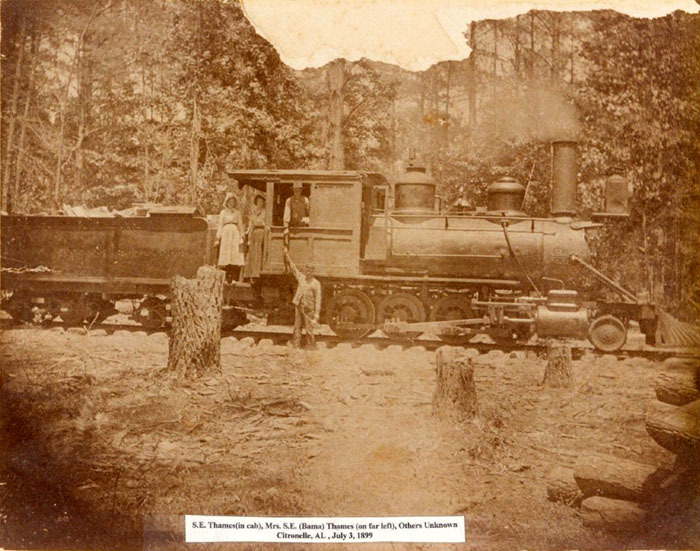 May 18, 1906, Castleberry, Conecuh Co., Alabama; d. February 1977, Decatur, Georgia. 3. ii. ROBERT VIRGIL MCLENDON, b. October 02, 1907; d. August 30, 1986.
iii. LUCY ROCHELLE MCLENDON, b. Private; m. CLAY GIBSON, Private; b. July 12, 1903; d. December 26, 1971, prob. Brewton, Escambia, AL..
(1) CORA. Forrest's sister Rochelle denied this first marriage occurred. (2) DORIS AVERY. Forrest and Doris had 1 daughter, living 2003. (3) ELMYRA PRICE Bef. 1940 in Phenix City, AL, daughter of GEORGE PRICE and ALICE GERALD. She was born September 13, 1907 in Webster Co., Georgia, and died May 13, 1999 in Phenix City, Russell Co., Alabama. Forrest and Myra had 1 daughter and 2 sons, living 2003. (5) HELEN MARIE KOHLMAN. Forrest and Helen had 6 children, 5 daughters and 1 son. 3. ROBERT VIRGIL MCLENDON was born October 02, 1907, and died August 30, 1986. He married SARAH LOUISE DEAN. She was born October 30, 1910, and died August 07, 1995. They had 2 sons and 2 daughters and lived in Brooklyn, Conecuh Co. AL. 4. Lucy Rochelle Gibson, Living 2003, married Clay Gibson b. July 12, 1903; d. December 26, 1971, prob. Brewton, Escambia, AL. Lived in Brewton, AL. No children. 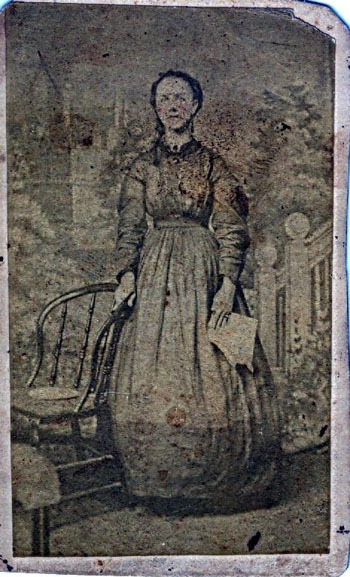 Lucy J. Thames, Daughter, Mar 1873, 27, S, AL, AL, AL. Relocation 1817� He was an accompanying familiy member in the relocation of an unknown person in 1817 at Monroe Co., Alabama; Other researchers have assumed that Cornelius B. Thames was the Cornelius Thames who was issued a passport through Indian Territory for himself, his wife, four children and seven negroes, all traveling from Beaufort District, SC. The 1810 census for the Beaufort District clearly enumerated this family with the passport as "Cornl. Tims, 1M0-9, 1M26-44, 3F10-16, 1F26-44, 7 slaves" The family with the passport appears to be the one referenced in "The Succession Records of St. Helena Parish, Louisiana 1804 - 1854": Cornelius Thames, February 22, 1821- Petition of Rachel Thames, widow of Major Cornelius Thames, who died February 1821, leaving no will and eight children. The children are all minors and their names are Reddin, Sarah, Mary, Rachel, Miss Hanson, Washington, Adeline, and Clementine. Dr. Timothy Thames, brother of the deceased, is appointed undertutor to the minors. October 16, 1827 - Petition of Mrs. Rachel Thames for a family meeting. October 16, 1827 - Family meeting recommending the sale of property it then names members whom attended. November 28, 1827 - The petition of Mrs. Rachel Thames shows she bought (this may mean she brought to the marriage) property consisting of one tract of land which was inherited from her grandfather in the State of SC. Her husband sold the land and purchased certain slaves. Her husband inherited $300 from his father's estate. She wishes the paraphernalia (pertains to parapherna or property brought to the marriage) property to be taken out of the succession etc. Mary Stearnes Henley, compiler, e-mail address, South Alabama Roots and Branches, Rootsweb: WorldConnect (online family tree). Paul & Cheryl & Becky Thames, compiler, FTDNA Thames Project Results, Family Tree DNA, 2010. Christian Index Obits, 1822-1879, 19 Dec 1987, pg 200, Col 1: Thames, Jesse, 63 yrs, b 10-6-1810, h. of Mary A E Boughton, d 11-24-1872, Wayne Co., MS. Prince Williams twp, Beaufort District, page 118. Transcribed from Ancestry.com image: "Cornl. Tims, 1M0-9, 1M26-44, 3F10-16, 1F26-44, 7 slaves." Passports Issued by Governors of Georgia, 1785-1809, Washington, DC: National Genealogical Society, 1962. Page 79: "Page 52--Thurs. 28th February 1811. On Application. ORDERED That passports be prepared for the following persons to travel through the Creek Nation of Indians--to wit, One for Mr. Job Rowley with his wife, four children and five negros, and one for Mr. Cornelius Thames with his wife, four children and seven negroes from Beaufort District..."
Mary E. Brantley, From Cabins to Mansions: Gleanings from Southwest Alabama, Huntsville, AL: The Strode Pub., 1981. Unk Twp, Monroe Co., AL, page 45: 1M15-19, 1F0-4, 1F15-19. Hub Broughton e-mail, 2 Aug 2002. Page 95. Cites Book 304, Register of Certificates - Cahaba Land Office, July 1820 to December 1835. Unk Twp, Monroe Co., AL, page 228: "1M-4, 2M5-9, 2M20-29, 2F0-4, 1F10-14, 1F20-29." Unk Twp, Conecuh Co., AL, page 382 from Lee Ponder: Jesse Thames, 40, M, NC; Mary A. E. 40, F, SC; Cornelius 19, M, AL; Stephen, 13, M, AL; Nathaniel, 15, M, AL; Susan, 13, F, AL; Sarah, 12, F, AL; Martha A., 9, F, AL; Nancy, 6, F, AL; Jesse C, 3, M, AL; Margaret, 2, F, AL. E-mail written 2001 to Warren L. Culpepper from Mary Hollis. Jean Strickland & Patricia N. Edwards, Records of Wayne County, Mississippi: Cemetery Records, Moss Point, MS: Strickland & Edwards, 1987. "Charlie R. Thames, 20 Apr 1851 - 22 Apr 1928." Evergreen, Conecuh Co., AL, pg 34, Hse 257, fam 329. From Lee Ponder: "Jesse Thames, 49, M, Farmer, RE=1000, PE=875, SC; Mary, 50, F, SC; Martha, 19, F, AL; Nancy, 16, F, AL; Jesse, 13, M, AL; Margaret, 11, F, AL; Charles, 9, M, AL; Lucy, 6, F, AL; Charlie Hall, 22, M, Farm Laborer, AL; Samel Landrum, 25, M, Teacher at school, SC." Beat 6, Old Town, Conecuh Co., AL, page 2, Transcription by Gertrude Stevens: Jesse Thames, 59, M, Farmer, NC; Mary A., 60, F, Keepog house, RE=720, PE=1000, SC; Nancy T, 26, F, AL; Margaret, 20, F, AL; Lucy A, 15, F, AL; Sarah E. Hall, 31, F, AL; Radford Hall, 10, M, AL. E-mail written 2004-2008 to Warren Culpepper from Becky Thames-Simmons, http://www.theywentthatway.com/genealogy/index.php, e-mail address. Gave it to his daughter Barbara O'Gwynn McDaniel, the current owner. Dis 2, Beat 2, Wayne Co., MS, page 288B, based on LDS CD transcription: T. Bryant, Self, M, Md, 37, Farmer, MS, MS, MS; N.T. Bryant, wife, F, Md, 37, AL, NC, SC; M.E. Thames, Mother-in-law, F, Wd, 70, SC, SC, SC; L.A. Wilkins, Sister-in-law, F, Wd, 26, AL, AL, SC; N.M. Wilkins, Other, M, S, 4, MS, MS, AL; O.C. Wilkins, Other, F, S, 3, MS, MS, AL; M.S. Boykin, Other, F, Wd, 32, AL, FR, AL; E.M. Boykin, Other, F, S, 27, AL, FR, AL; Lucretia, Other, F, S, 2, MS, AL, AL [M.S. and E.M appear to be sisters, with E.M. the mother of Lucretia]. "Mary A. E. Broughton Thames May 1810 - 14 Aug 1882 [sic]" Year of death actually appears as 1883 on her tombstone. 1880 Census* 1 Jun 1880� Alexander was listed as the head of a family on the 1880 Census at Brooklyn, Conecuh Co., Alabama. Evergreen, Conecuh Co., AL, page 1000, Hse 335, fam 315. Mary Thames, 3/12, F, AL. William Thames, 1, M, AL. Beat 7, Brooklyn, Conecuh Co., AL, page 87C, based on LDS CD transcription: "Alexander Thames, HH, 28, AL, AL, AL; Lucey E., Wife, 23, AL, AL, AL; Ugener J,, Dau, 2, AL, AL, AL." Conecuh County Court, Conecuh Co., AL, Direct Index to Deeds A-Z 1866-1901 GSU, Salt Lake City, 1989 (FHL Film 1,630,472 #1) . Brooklyn, Conecuh Co., AL, ED51, page 240B, Ancestry.com Img #20 transcribed by Warren Culpepper: "Alec T Thames, Head, Apr 1832, 48, Md 26 yrs, AL, AL, AL; Lucy E Thames, Wife, Oct 1857, 42 , Md 26 yrs, 9 children/6 living, AL, AL, AL; Eugene J. Thames, Son, Apr 1878, 22, S, AL, AL, AL; Edna S. Thames, Daughter, Jul 1880, 19, S, AL, AL, AL; Callie Thames, Daughter, Sep 1882, 16 [sic], S, AL, AL, AL; Addie A. Thames, Daughter, Sep 1884, 15, S, AL, AL, AL; Coleman J. Thames, Son, Dec 1886, 13, S, AL, AL, AL; Percy B. Thames, Son, Mar 1889, 11, S, AL, AL, AL; Sallie R. Thames, Daughter, Oct 1891, 8, S, AL, AL, AL." Willene Johnston Whatley, "Brooklyn and Johnstonville: Places in Times", 1996. Old Town, Conecuh Co., AL, page 87C, based on LDS CD transcription: "James Thames, HH, 24, AL, AL, AL; Julia Thames, Wife, 20, AL, AL, AL; Mary Thames, Dau, S, 1, AL; Adam C. Thames, Other [Brother], S, 21, AL; Corbin Jane, Other, Male, Wd, 61, SC, SC, SC, Physician." Bolling Town, Butler Co., AL, ED 23, Page 269, Genealogy.com image transcribed by Warren Culpepper. Lee Ponder transcription: "Jesse E fam 51 b Oct 1866. In hse of Jesse Alfred Tims 52 b AL Aug 1848, Editha 47 May 1853 & Dora D b May 1881. Editha marked sister." E-mail from Anna Mary Ellerbee to Warren Culpepper, 30 Oct 2002. 1880 Census 1 Jun 1880� Lucy was listed as Alexander Travis Thames's wife on the 1880 Census at Brooklyn, Conecuh Co., Alabama. 1880 Census 1 Jun 1880� Eugene was listed as a daughter in Alexander Travis Thames's household on the 1880 Census at Brooklyn, Conecuh Co., Alabama. Middle name form birth register for children. - 1900 census Choctaw Co AL fam 51 Mary A b May 1866 w/o Jesse E Thames. - After Mary Abigail Hart Thames died, Elizabeth Thames, b 1871, raised Mary's dau Mary Elizabeth. Libby Barker Rice, Granddaughter of Mary Elizabeth Thames Howell. E-mail written Aug 2012 to Warren L. Culpepper from William Anderson Thames Jr. (#63612), Pensacola, FL, e-mail address. 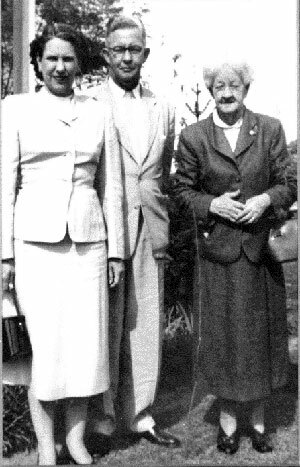 Wilene J. Whatley and Sarah R. Coker, Conecuh Co., AL Marriages, Vol. 1, Southern Business Forms, 1990.